The arrival of rookies Kristaps Porzingis, Jahlil Okafor provide intrigue to the Atlantic division dominated by the Toronto Raptors. Here’s SI preview of the Atlantic division. The Knicks and Nets tend to dominative the narrative in the Atlantic, but you have to look outside of New York to find the true power players in the division. The Raptors and Celtics are unlikely to become League Pass staples anytime soon, but they’ve turned into unlikely breadwinners in the division as the New York teams flounder in mediocrity. Toronto owns arguably the best backcourt in the league outside of Golden State and has the necessary veteran complements to make them the heavy favorites, while Boston’s mish-mash of talent and bright head coach make them the closest thing to a dark horse in this division. How do all five Atlantic teams look heading into 2015–16? Let’s dive into our season preview. • NBA middle class in tricky spot | Who goes from lottery to playoffs? Outlook: The Raptors are unlikely to be challenged as they go for their third straight Atlantic Division crown—the question is what will they do after that? Toronto has set franchise records for wins in each of the past two seasons, but its playoff performance has been dismal, failing to advance out of the first round. Last season, the Raptors were embarrassingly swept by the Wizards despite holding home-court advantage. This year, there’s cause for optimism. The Raptors landed DeMarre Carroll this summer—the closest Toronto will come to reeling in a marquee free agent—and fortified its bench with the grab bag of Luis Scola, Bismack Biyombo and Anthony Bennett. Kyle Lowry is in the best shape of his career and DeMar DeRozan is in a contract year. Sometimes you need to suffer the lows in order to achieve the highs in the NBA. With All-Star Weekend also coming to Toronto this year, the table is set for the Raptors to steal the spotlight. Best case: Lowry’s new slender frame doesn’t diminish the size of the chip on his shoulder, fueling the Raptors to their first conference finals appearance in franchise history. Worst case: Injuries rear their ugly head and Toronto finds itself stuck in the mud, producing another good-but-not-great year with an all-too-familiar first-round exit. Outlook: The Brad Stevens Era enters Year Three in Boston and for the first time the Celtics coach will deal with legitimate NBA expectations. No one in the Celtics’ front office expects this team to make a deep playoff push, but rather add to the impressive rebuilding job already underway. Stevens’s Celtics improved by 15 wins last season, largely thanks to a defense that ranked in the top half of the league and an offense that managed to make lemonade without any fruit. Boston’s three-pronged backcourt attack of Isaiah Thomas, Marcus Smart and Avery Bradley gets some much-needed frontcourt help with the arrivals of David Lee and Amir Johnson. Neither is a strong two-way player, but their respective strengths tower over Stevens’s previous options. Boston may have one of the strangest mix of veterans, young players and assets in the league, but luckily they have a coach who seems up to the task of jelling everything together. Best case: Boston’s building blocks begin to appear more defined as the Celtics finish the season with their best record since the Big Three were in town. Worst case: The veteran reinforcements stunt the growth of the Celtics’ young bigs and the right trade never comes along for Danny Ainge, leading to a year in limbo before next summer’s big spending spree. Outlook: Optimism was as scarce in Madison Square Garden last season as NBA talent, but that’s about to change with the return of Carmelo Anthony and the addition of some solid role players. Robin Lopez will man the middle and clean the glass, Arron Afflalo gives Carmelo someone to kick to and serve as a secondary scorer and Kevin Seraphin, Kyle O’Quinn and Derrick Williams will give the Knicks … something. 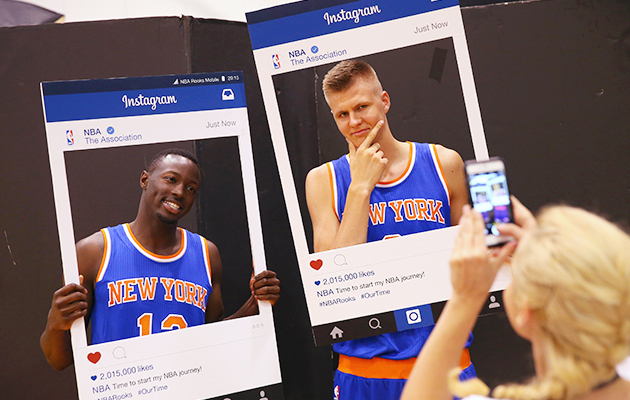 The biggest question is how much New York’s pair of first-round picks—Kristaps Porzingis and Jerian Grant—will make an impact. If Derek Fisher is able to coax something out of his youngsters while getting contributions from his new veterans, the Knicks could make a return to the playoffs. If Phil Jackson’s signings fall flat and the rookies are greener than James Dolan’s bank account, New York could go nuclear with its rebuild, leading to the potential departure of Anthony. Best case: Carmelo wins the scoring title, Lopez and Afflalo stay healthy and productive, and the Knicks make a return to competitive basketball while giving a glimpse into the future (Morzingis!). Worst case: How dark do you want to get? Carmelo gets hurt and the free-agent signings make no sense without him? Porzingis looks like Tskitishvili 2.0? Matt Barnes kills Derek Fisher? Phil Jackson retreats to Montana? With the Knicks, “worst-case scenario” knows no bounds. Outlook: The Nets will be decent. Lionel Hollins is a proven bench man and the trio of Brook Lopez, Joe Johnson and Thaddeus Young affords Brooklyn of some semblance respectability. Those are literally the two nicest things I can say about the team. When you take the kiddie gloves off, the future is rather bleak for Brooklyn. No team is caught between the present and future worse than the Nets. They boast a veteran-laden roster, but have no chance of competing for a title. The signings of players like Andrea Bargnani, Dahntay Jones and Wayne Ellington would suggest this team is on the cusp of something, but Brooklyn’s front-office moves have doomed this team’s future. Without draft picks or cap space, the Nets can’t look down the road to brighter days. Instead, they’re forced to deal with the present, as unappealing as it might be. Unfortunately for the Nets, they are equally unlikely to be playoff participants or high-lottery finishers, meaning another year of mediocrity is on the horizon. Best case: The Nets turn into a poor man’s version of the Heat, boasting a strong starting five and sneaking into the playoffs thanks to the deft hands of their veterans. Worst case: Brooklyn bottoms out despite owning the fourth-highest payroll in the league anc leading to an extremely expensive disaster even for New York’s standards. Outlook: The Sixers continue their slow slog toward relevance with yet another rebuilding season ahead. The selection of Jahlil Okafor gives Philly its first instant-impact rookie since Michael Carter-Williams, but it’s not clear how he’ll fit alongside Nerlens Noel. Will the two be able to overcome their lack of floor-stretching ability? The good news is they’ll likely be able to play through their struggles due to the team’s lack of other options. Joel Embiid will likely sit out the season and Dario Saric remains in Europe, meaning Philly’s youth movement will continue to feature players you’ve vaguely heard of. Nik Stauskas should get heavy run after coming over in a trade from Sacramento and Robert Covington, Tony Wroten and others will get a chance to prove they belong in Sam Hinkie’s master plan. The Sixers are a solid bet to best their 18-win campaign from last season, but not by much. Best case: Jahlil Okafor wins Rookie of the Year and Nerlens Noel turns into a double-double machine, giving the Sixers a pair of prospects to build around (for real). Worst case: Jahlil Okafor wins Rookie of the Year and Nerlens Noel turns into a double-double machine, giving Sam Hinkie two assets he can turn into 12 draft picks. Jonas Valanciunas, Raptors. It’s time for Toronto’s fourth-year center to become a star after signing an off-season extension. Valanciunas averaged 12 points and 8.7 rebounds last season and played in 80 games, but sat out 23 fourth-quarters and played just 26.2 minutes. Toronto brought in Bismack Biyombo to help out with the departure of Amir Johnson, but Valanciunas can add to the solution if he can stay on the floor and become better defensively. The 23-year-old’s averaged 16.5 points and 11.9 rebounds per 36 minutes last season, numbers good enough to earn an All-Star bid, in his backyard nonetheless. Kristaps Porzingis, Knicks. I will literally be watching the Latvian's every move this season, so he’s an easy pick. Few rookies have entered the league in recent years with so much intrigue and Porzingis gets the (unfortunate) benefit of having every move documented by the New York media. Porzingis won’t have a huge impact on the 2015–16 Knicks, but he should give an indication of whether the 2016—17 iteration and beyond are promising. Derek Fisher, Knicks. All five Atlantic Division coaches not named Brad Stevens face a hot seat this season, but none more scalding than Fisher. The longtime NBA point guard had little-to-nothing to work with last season, but the same can’t be said this year. Fisher will need to deliver on some of his promise or he could potentially face the wrath of the coaching carousel. David Lee, Celtics. The veteran power forward will likely thrive in Boston, but that doesn’t mean he’ll stay there. The 32-year-old is on an expiring contract, is likely to put up solid vanity stats and proved last season he’s a consummate pro even when dealing with a demotion. Sounds like a perfect trade deadline pick-up for a contending team. Danny Ainge makes a midseason trade to better the current Celtics, leading to a playoff berth and a first-round victory for Brad Stevens’s bunch.